Eurocom is proud to launch the 15.6” Sky MX5 R3 thin and light Gaming Laptop with NVIDIA GeForce GTX 1070 graphics, Intel Core i7 7700HQ or 7820HK (Kaby Lake) processor up to 64 GB of DDR4 memory, 4G LTE Internet on the go support and up to 12 TB of Solid State storage. The EUROCOM Sky MX5 R3 is a potent fusion of performance and ultra-portability. Never before has so much power been matched with such a small form factor. Eurocom Gaming laptops are comprised of a potent blend of high power, long battery life, light weight, and are loaded with features. The on-board, surface-mount design of the CPU and GPU keeps these laptops’ weight down, and allows us to pack more features into a slimmer form factor. The onboard components also minimize power consumption, which means less heat when you’re gaming on the go! The on-board, BGA version of the Intel Core i7 7700HQ or 7820HK 45W CPU and the on-board NVIDIA GeForce GTX 1070 GPU keeps this laptops’ weight and thickness down, and allows to pack more performance and features into a slim form factor. The onboard components also minimize power consumption, which means less heat when gaming on the go for a slim form factor, and a light weight! Users can get the performance and the capabilities they want, they can customize the Sky MX5 R3 memory with up to 64 GB of DDR4 memory, and up to 4 storage drives (two M.2 slots and two 2.5 inch storage bays, for a maximum storage capacity of up to 12 TB). User’s data will be kept secure with a Kensington lock, biometric security, and Eurocom’s Trusted Platform Module (TPM 2.0) data encryption. TPM encrypts data so only you have access to it, even if the machine is misplaced or stolen. The brushed aluminum, heavy-duty chassis will hold a Full HD, IPS, G-Sync panel, ideal for those first-person shooters, or a 4K QFHD, IPS display, for epic visuals to kick your gaming into high-gear with no draw backs! 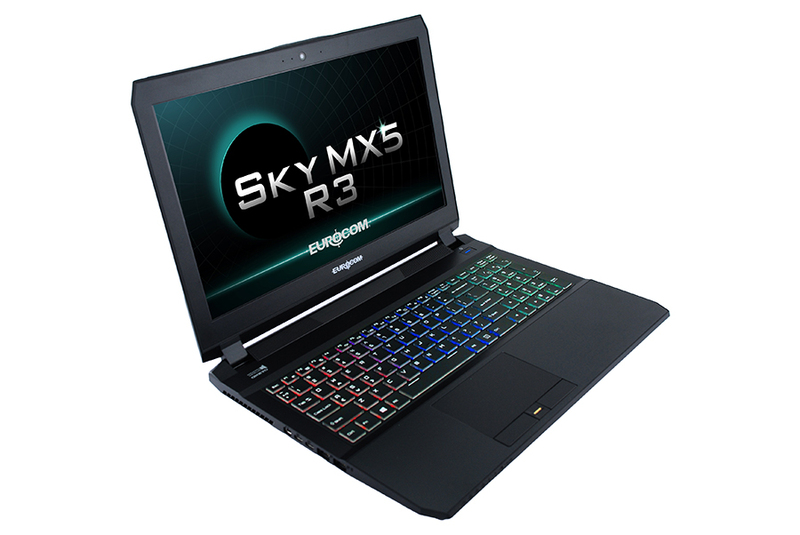 The EUROCOM Sky MX5 R3 has support for four 260-pin SODIMM and can support up to 64 GB DDR4. EUROCOM Sky MX5 R3 comes prewired for 3G/4G/LTE module. There is M.2 slot available inside the system to install optional broadband internet module and SIM slot for 3G/4G/LTE access card. The EUROCOM Sky MX5 R3 supports on-board Intel Core i7 7820HK (Kaby Lake) processor with 4 cores, 8 threads and 6 MB L3 cache with Intel HD Graphics 630 graphics. BGA version of CPUs tends to be more power efficient – 7820HK consumes approx. 45W of power. The EUROCOM Sky MX5 R3 has an onboard high performance gaming class NVIDIA GeForce GTX 1070 graphics with 8 GB GDDR5 video memory. The EUROCOM Sky MX5 R3 offers choice of four 15.6” display panels from full HD to 4k, matte or glossy. The data in the Sky MX5 R3 will be protected with a Kensington lock, Biometric Fingerprint Reader, and Trusted Platform Module (TPM 2.0) data encryption. TPM encrypts all your data so only you have access to it, even if your machine is misplaced or stolen.